Wow – what a whirlwind few days! Blog land is keeping me very busy (not what I’d planned for at the beginning of the 6 week school holidays). Thank you to everyone who’s liked my blog and my shark pattern since I published a picture of it back in April, then finally found the time to type the pattern up at the beginning of May. To answer a few questions about the shark pattern first. An adult version will come as soon as my fingers and children allow. There is now a PDF of the Shark pattern (Click the blue words) to print out hopefully saving a few trees, as it’s only about 5 pages. “Are you going to write up the Mermaid Tail?”. (The original post can be found here). Finished items may be sold, but the pattern remains my property, I just ask that you give credit to me, Vicki Roberts at www.offthehookforyou.co.uk – and link this blog. Yarn: Magic Aran in the blue and pink mix. Yarn Qty – 350g (Each 250g ball is 411 yards according to Ravelry- so I calculate you need about 580 yards per tail). (I made 2 tails from 2 x 250g balls – one for a 4 year old, one for a 7 year old). I ran out for the second tail and used 2 strands of blue and green together for the fin!). 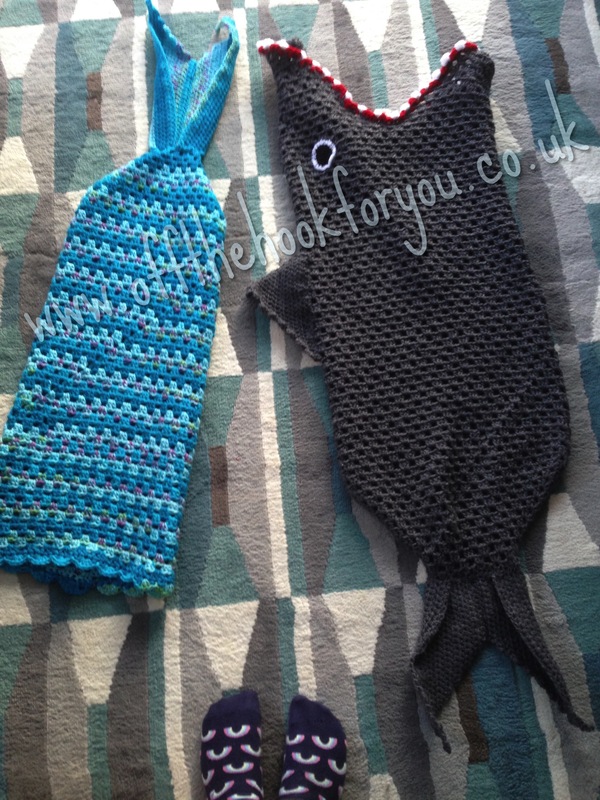 Fins – I have to thank a lovely lady called Michelle for the fin pattern. I did not design the fins myself – but used good old Pinterest to find a free pattern which another kind blogger had shared. The exact link I did was this one all as normal HDC (as I forgot to do BLO! ), and I started with 40 HDC’s and reduced to 26 stitches, then sewed together or SC together. (This was the basis of the shark pattern too). Row 3- Ch3, 1DC, Ch1, 2DC over where you have SS (shown below). 1 DC cluster in the next 5 spaces. 2DC, Ch1, 2DC, in the next gap then 1 DC cluster in the next 5 spaces. SS over to top of Ch3. Row 4- Ch3, 2DC in same gap (over the SS join). In the next gap (which should be the 2dc ch1 2dc)- do a 2dc, ch 1 2dc, 1 DC cluster in the next 6 spaces (which puts you over the 2dc ch1 2dc gap again) do a 2dc ch 1 2dc in teh Ch1 gap from the round before, followed by 1 DC cluster in the next 5 spaces, SS over. (Row 4 is basically repeated – but the number of DC clusters each side varies to ensure the 2dc ch1 2dc are all in the same place – see the photo below to demonstrate). Row 5 – Ch3, 2DC in same gap (over the SS join). 1Dc cluster. In the next gap (which should be the 2dc ch1 2dc)- do a 2dc, ch 1 2dc, 1 DC cluster in the next 7 spaces (which puts you over the 2dc ch1 2dc gap again) do a 2dc ch 1 2dc, followed by 1 DC cluster in the next 5 spaces, SS over. Row 6 – Ch3, 2DC in same gap (over the SS join). 2Dc cluster. In the next gap (which should be the 2dc ch1 2dc)- do a 2dc, ch 1 2dc, 1 DC cluster in the next 8 spaces (which puts you over the 2dc ch1 2dc gap again) do a 2dc ch 1 2dc, followed by 1 DC cluster in the next 5 spaces, SS over. Row 7- Ch3, 2DC in same gap (over the SS join). 3Dc cluster. In the next gap (which should be the 2dc ch1 2dc)- do a 2dc, ch 1 2dc, 1 DC cluster in the next 9 spaces (which puts you over the 2dc ch1 2dc gap again) do a 2dc ch 1 2dc, followed by 1 DC cluster in the next 5 spaces, SS over. Row 8 – Ch3, 2DC in same gap (over the SS join). 4Dc cluster. In the next gap (which should be the 2dc ch1 2dc)- do a 2dc, ch 1 2dc, 1 DC cluster in the next 10 spaces (which puts you over the 2dc ch1 2dc gap again) do a 2dc ch 1 2dc, followed by 1 DC cluster in the next 5 spaces, SS over. (Stop increasing here for a 3-4 year old – 30cm diameter). Row 9 – Ch3, 2DC in same gap (over the SS join). 5Dc cluster. In the next gap (which should be the 2dc ch1 2dc)- do a 2dc, ch 1 2dc, 1 DC cluster in the next 11 spaces (which puts you over the 2dc ch1 2dc gap again) do a 2dc ch 1 2dc, followed by 1 DC cluster in the next 5 spaces, SS over. (Stop increasing here for a 4-5 year old – 33cm diameter). Row 10 – Ch3, 2DC in same gap (over the SS join). 6Dc cluster. In the next gap (which should be the 2dc ch1 2dc)- do a 2dc, ch 1 2dc, 1 DC cluster in the next 12 spaces (which puts you over the 2dc ch1 2dc gap again) do a 2dc ch 1 2dc, followed by 1 DC cluster in the next 5 spaces, SS over. (Stop increasing here for a 5-6 year old – 37cm diameter). Row 11 – Ch3, 2DC in same gap (over the SS join). 7Dc cluster. In the next gap (which should be the 2dc ch1 2dc)- do a 2dc, ch 1 2dc, 1 DC cluster in the next 13 spaces (which puts you over the 2dc ch1 2dc gap again) do a 2dc ch 1 2dc, followed by 1 DC cluster in the next 5 spaces, SS over. (Stop increasing here for a 7-8 year old – 39.5cm diameter). Row 12 (or the stop increasing row) – Ch3, 2DC in same gap (over the SS join).1 DC cluster in each gap, SS to join. Row 12 is repeated until you get to the desired length (height) of the tail. For my 4 year old one this was 79cm – or a further 49 rows. Row 1 – 1 row of SC all the way around the top. Row 2 – 5 DC in the first stitch. 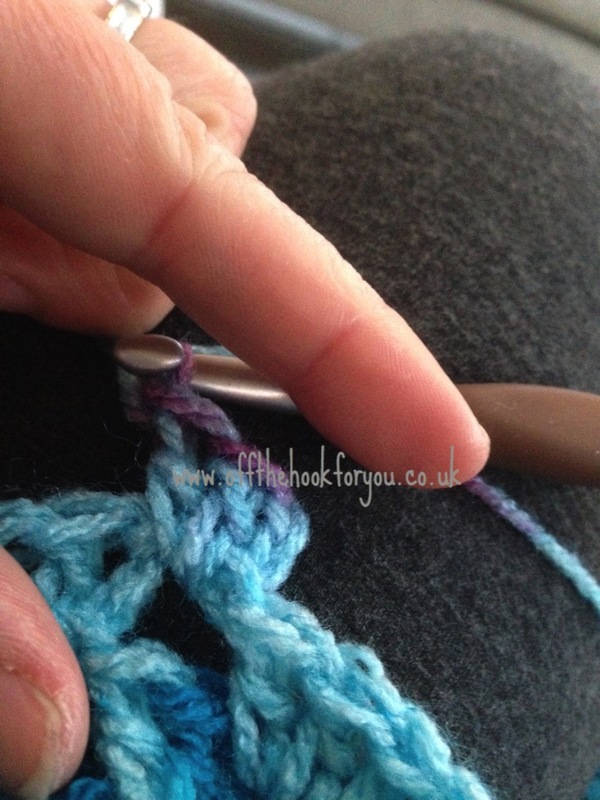 *Skip 1 stitch, SS under the 2nd, Skip 1 stitch, in 2nd make 5 DC* – repeat from * to * all the way round. Then just sew your tail to your cocoon…. and find a child who wants to be a mermaid …… I don’t think that’ll be too hard (I’d be a mermaid if I could!)! As a reminder ….Finished items may be sold, but the pattern remains my property, I just ask that you give credit to me, Vicki Roberts at offthehookforyou.co.uk – and link this blog. I know lots of people are having trouble printing things nicely from my blog – so here is a PDF for you! Hi I have read this mermaid pattern 3 times but don’t see any directions for making the tail just the body is here help? And there is the link to click in the text. 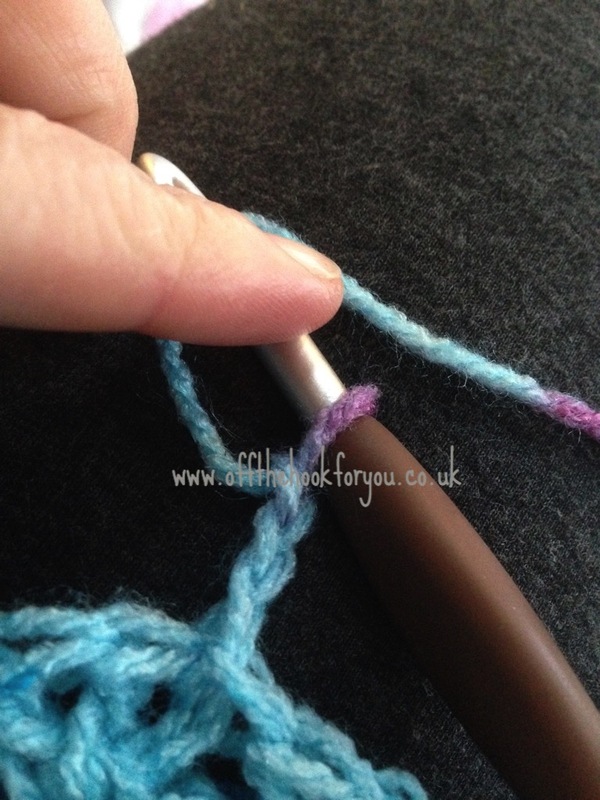 Hope this helps – happy crocheting. The yarn I want to use is a bulky (5) weight. How wide is the bottom of the tail so I can adjust my st count accordingly? And should the count be a multiple of anything? Thanks for a great pattern! So does this mean there are 61 total rows? The chain 1 gap will only be there for the round 12. You do 3 DC in here (1 DC Cluster) on the stop increasing round. Then for round 13 it won’t be there – so it’s just treated like a ‘normal’ gap. So I do 3 dc in that chain 1 gap on round 13 ? Yep – then it disappears to be a normal cluster. Do you have this pattern for a infant? 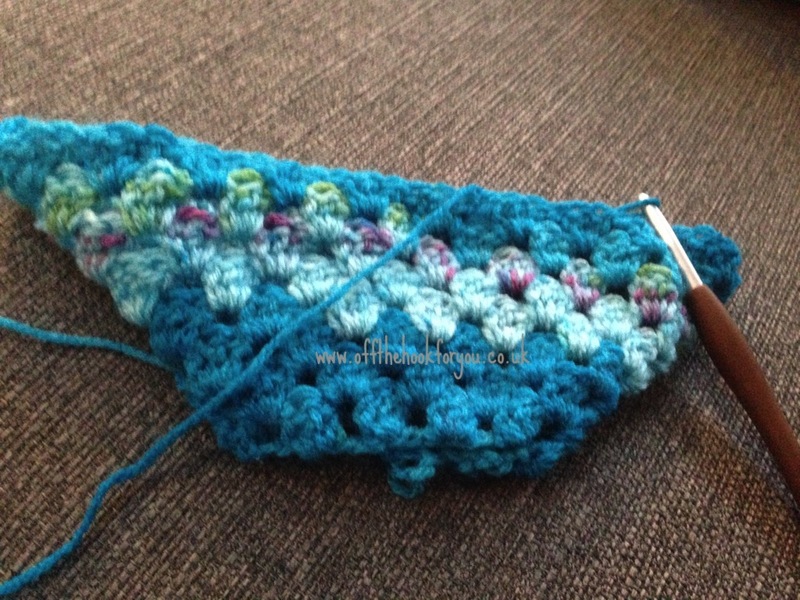 Love the pattern… I have got the Mermaid almost done. A lady wants to by it… I have no idea what to charge. Have $14.oo in yarn… What would you think ? ? ? ? Entirely up to you! A guide people say is 3 x the cost of materials for anything you make. Etsy similar things sell for anywhere between £25 and £60! Thank you very much! I’m definitely one for the easiest route if I can! Hi there, I’m wondering if this is an American pattern? 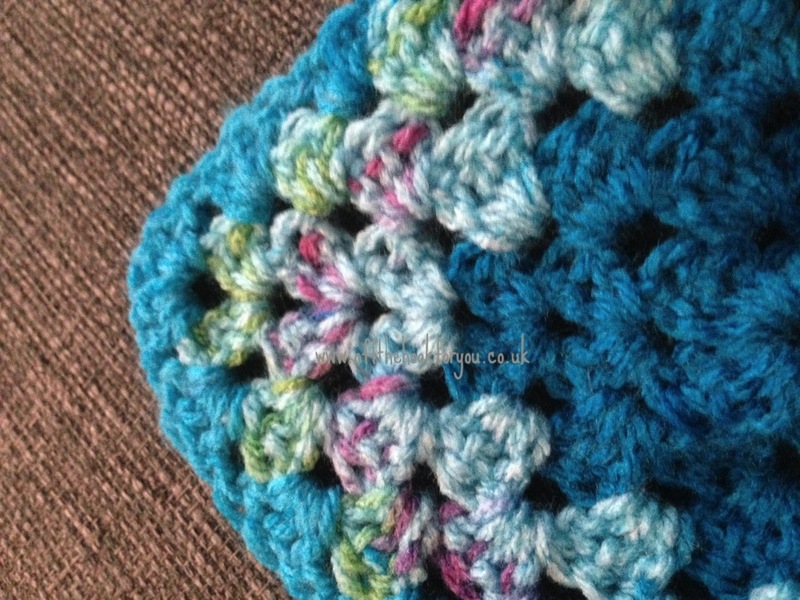 I’m new to crocheting, have mastered granny squares and would like to try this pattern. Still get a bit confused between American and English. (I’m in Scotland) learnt from U tube . I want to make an adult mermaid tail. How do I increase to an adult size and when do I know when to stop increasing? Fdhc is instead of the chain! If you want to chain just add 2 ch to the fhdc number and then do a row of hdc skipping the first 2 ch! I will share your work with a friend. Thank you madam. What make of yarn did you use for the shark? The link doesn’t seem to work for me. Thanks!